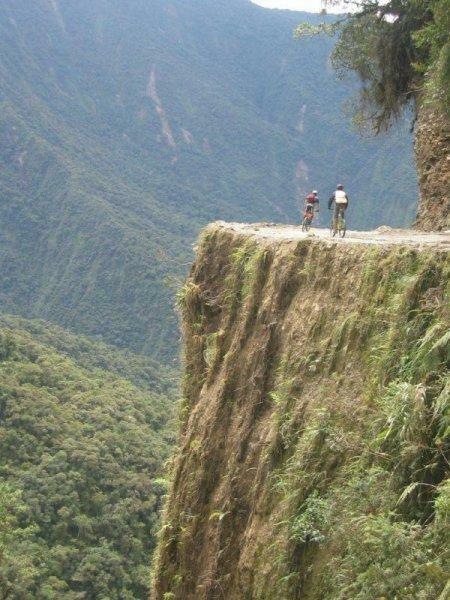 The North Yungas Road (also Grove's Road, Coroico Road, Camino de las Yungas, El Camino de la Muerte, Road of Death, and Death Road) is a 66km road leading from La Paz to Coroico, 56 km (35 miles) northeast of La Paz in the Yungas region of Bolivia. It is legendary for its extreme danger and in 1995 the Inter-American Development Bank christened it as the "world's most dangerous road". One estimate is that 200-300 travelers were killed yearly along the road. The road includes crosses marking many of the spots where such vehicles have fallen. But that was back in the day! Nowadays the road is only used by tour operators and riders and the crazy drivers use a new sealed road that follows a different route. Review: Ignore the hype, the Death Road is not very dangerous. OK, there is that famous photo of the big drop with no guard rails and if you go down it you're dead! But you won't - the road is wide and you'll be able to keep well out of danger's way. The road earned its reputation in the bad old days when it was an arterial route with lots of trucks going up and down - and trying to pass where there just wasn't enough room for two trucks to pass! 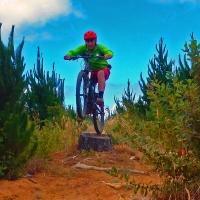 Nowadays this is one of the world's great down hill road bike rides and simply - it's a blast! If you get the chance do it! It's one of La Paz's most popular adventure tourism attractions and dozens of riders do it almost every day... Many of them are unskilled riders... And they don't come to grief - they just follow their front wheel all the way - for the best part of the day - and it's practically all down hill for about 9,000 feet... At the bottom you celebrate with a beer or some local rum, have a nice meal, and get on the shuttle for the ride back - on the new sealed road. El Camino De La Muerte MTB Trail 4.00 out of 5 based on 1 ratings. 1 user reviews.